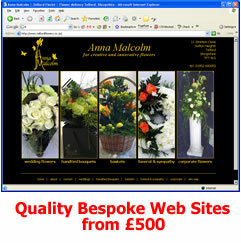 Quality web sites at affordable prices & Getting them found by the same provider! Does your web site need an overhaul? Want to offer your customers 24/7 service? Is your site not getting found on search engines? All Florists along with Internet Managers have been helping people with these issues for years and have many satisfied customers with good looking websites which work well, most of which offer a shopping cart allowing consumers to buy their products 24/7. for a list of many of our developments click here. Offering a Full Service not just part of one! We are amazed at how many of our customers don't actually know what we can do for them! Web Site design & development - Whether you want an affordable site designed for you which has everything you want in it or want a full e-commerce shopping cart site or even want a shopping cart added to your existing site we can supply! Web Site Marketing - We are specialists at Marketing web sites, with top directories of our own and the ability to cross market web sites there hasn't yet been a customer who wasn't completely satisfied! SEO (Search Engine Optimisation) - We are becoming increasingly aware of customers who have good sites that just don't get found. We're here to help, with specialist SEO advice and a FREE check-up of your site to see where it can be improved there is always something that can be done to get your site found no matter what the competition. or email info@allflorists.co.uk with your enquiry.